This report appears on the Zurich Crickets website. 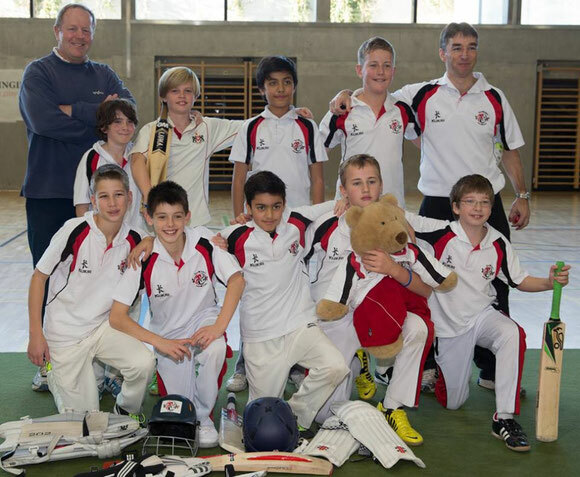 Basel Dragons beat Zurich Crickets in the final to win the 2013 Gingins U13 indoor tournament that took place at the La Chataigneraie on Saturday 23rd & Sunday 24th November. Zurich started the 2013 Gingins U13 indoor tournament with a match against CDL. Zurich batted 1st with a total of 83 runs. Luke scored a fast 26 runs with 2 sixes and 2 fours. Luke was well supported in the innings by Hamish and then Chris who was the 2nd highest scorer with 12 runs. CDL then scored 87, wining the match. Hamish took one wicket with an excellent bowl and another wicket with a great catch. Dayn, Luke, Chris and Haresh also took one wicket each. However the bowling was generally not accurate and we gave away 53 extras which lost us the match. The 2nd game was against Gingins. Gingins batted 1st with a score of 98. Luke, Hamish, Dayn and Haresh all took wickets and the bowling was much more accurate than the previous match, giving away only 28 extras. Vikram did a solid job as wicket keeper and stopped several. Zeki took a spectacular catch and the fielding was tight with a great team spirit. Zurich´s innings totaled 101 and we won the match. Luke scored 29 (with 4 fours), Chris 20 and Hamish and Haresh 6. There was some excellent running which helped us build a commanding score. Zurich won a place in the semi final against Basel. Basel batted 1st and scored 127 runs. Zurich bowled well and made the batsmen work for the score. Chris took 2 wickets with Luke, Dayn and Haresh taking one wicket each. Vikram took a great catch. Again the team spirit was excellent. Zurich batted extremely well and scored 96. Dayn scored a solid 17 and supported Luke to 19 runs and Chris to 15 runs. Hamish also supported well and scored 5 runs. Again excellent running helped build the score. Despite not winning, the team showed great team spirit, good sportsmanship and this was an exciting match to finish the tournament. Want to read Chris Clayton's Basel Dragon's match by match U13 Gingins indoor tournament report?